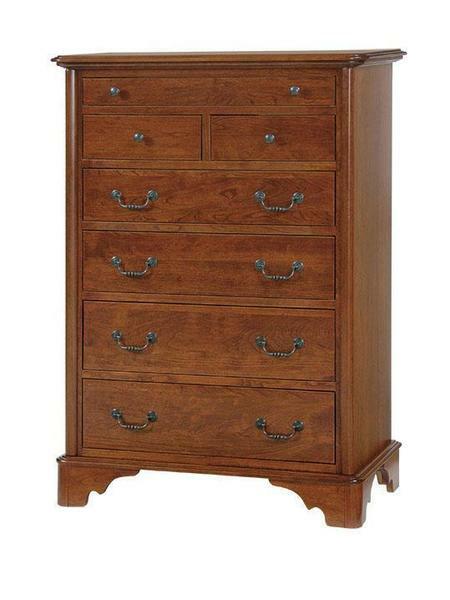 The Early American style Chest of Drawers will offer your bedroom a touch of timeless elegance. This chest of drawers has the look of a hundred year old antique but it is made just for you by an Old Order Amish woodworker.This chest of drawers is proudly made in the USA of 100% solid hardwood. Please call for more information on our Amish bedroom furniture. This chest of drawers is 39" wide by 20 deep and 54" high. If you are looking for custom dimensions then please give one of our Amish furniture specialists a call for a quote. Custom furniture is our specialty! The standard wood choices on this chest is Red Oak Wood and Cherry Wood. Other woods are available upon request. We offer a variety of stain and paint options as well as custom stain matching. This Chest of Drawers is solid wood Amish construction. You will be very impressed by the quality of our furniture.